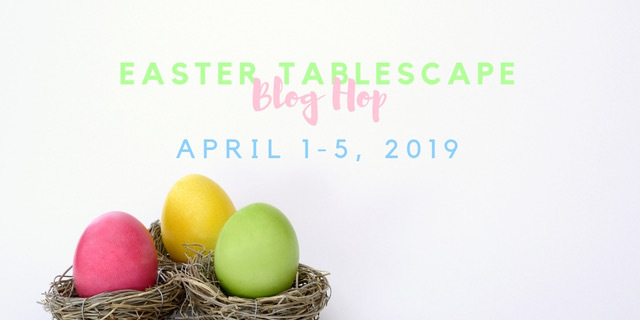 Welcome to an Easter Tablescape Blog Hop sponsored by Chloe Crabtree @Celebrate and Decorate. 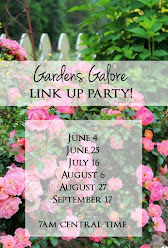 The blog hop schedule and links to the participants are available at the end of this post. Chloe started these tablescape hops in 2016. Thank you Chloe, for all the hard work you do organizing these hops. My childhood memories of Easter include straw Easter baskets filled with green paper straw and dyed Easter eggs, early sunrise services, starched stand out dresses, and new white Sunday shoes with lacy socks and sometimes a special hat. Later as I grew older I came to appreciate the true meaning of Easter - the cross and the empty tomb. The flowers growing around Easter in our state of Alabama are azaleas of various varieties and colors, dogwoods, and irises. 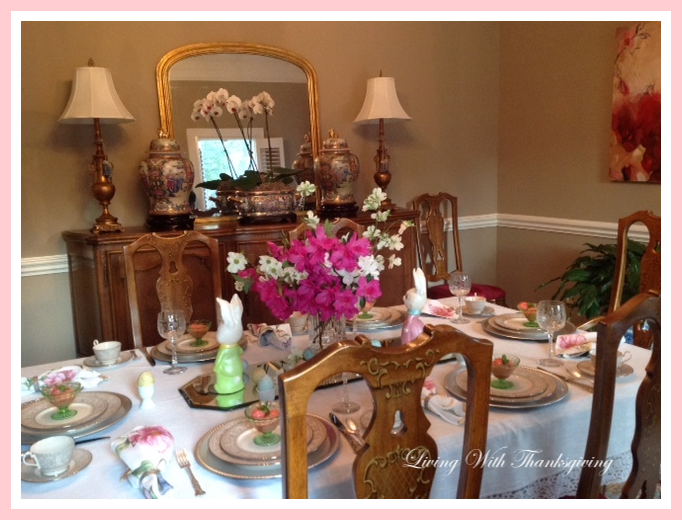 It was a visit down memory lane planning my Easter tablescape using memorable flowers. I love using my mother's ceramic rabbits which she painted herself. I treasure them along with my fond memories since my parents died over 35 years ago. I was pleased to find some dogwoods in the woods near my home and azaleas from a neighbor since mine bloomed early. It is special for me to use the vase for the centerpiece that was a gift from my friend who passed away in early January. It is hard to see, but I also have a few sprigs of bridal wreath in the arrangement. They bloomed early this year also. I remember walks with my parents every year at Easter going to a particular spot in the woods to pick wild violets. It was a treat to find ones with velvet petals. It was like finding the golden egg. I would consider my tablescape perfect if I could have a nosegay of wild violets on my table. But the memory and sharing that with you will have to suffice. My Franciscan Platinum Renaissance wedding china goes well with the spring garden flowers. The floral napkins complement the floral arrangement and little egg cups holding Easter eggs are placed at each place setting. Green Depression glass sherbets hold raspberry sherbet garnished with sprigs of mint from my garden. This view shows off the new abstract painting my daughter painted for me. (amschnorrenberg_art) I just love it! 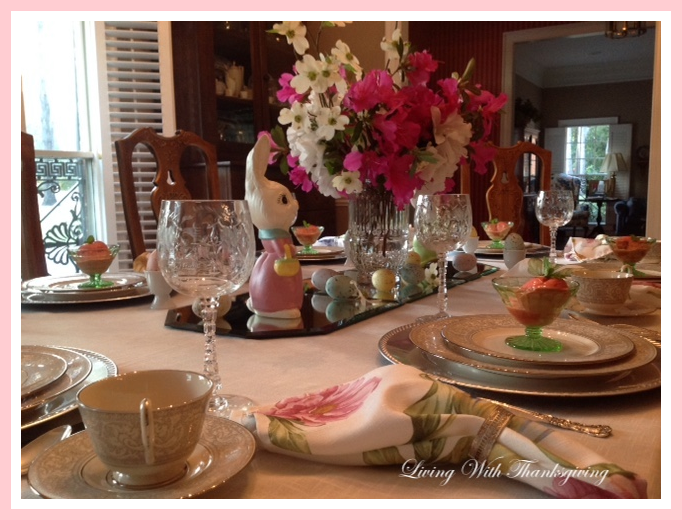 I have fond memories of Mr. and Mrs. Rabbit gracing my mother's Easter table. I think they have so much personality. Mr. Rabbit's neon green coat was very stylish in the '70s! This picture also has a good shot of the etched crystal glasses that were my father-in-law's aunt's. I believe they are Austrian. Are family pieces special to you? They are to me. Azaleas not only have pretty spring colors but have a lovely aroma also. The sherbet started melting on me as the light was fading so there was no time to do the sherbet over for pictures. Wishing you a blessed Easter. I've been singing the chorus to the hymn "At the Cross "as I set this table. The words go like this.....At the cross, at the cross where I first saw the light, and the burden of my heart rolled away. It was there by faith I received my sight, and now I am happy all the day! 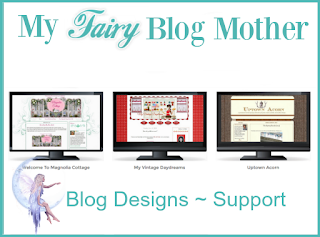 Please take the time to visit all the blogs below and leave them a comment so they will know you enjoyed their post. Bonnie, your table is beautiful with all your treasured family pieces. I have my mother's china which I always use at Easter, it makes me feel like she is next to me in every step as I set our table. Your centerpiece is stunning, holding such beautiful blooms. Bonnie, I especially enjoyed reading about your walks looking for violets. I remember many outings helping my mom gather wild violets. She would make violet jelly. Violets are everywhere here in West Virginia, so finding them was easy - but it took so many for her jelly. 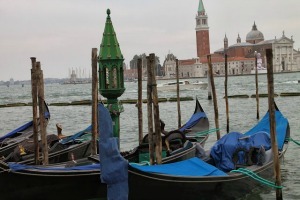 Again, a lovely post and thank you for the memories. Happy Easter to you and your family. Family pieces are indeed special and so are memories, so I simply adored this post. Your china and glassware are so beautiful; it really sets the table beautifully and I love the combo of flowers in the centerpiece. I don't see a lot of dogwood here. I think I need to find some! Your daughter is a splendid artist and her canvas looks so wonderful in your home. I think you are definitely ready for Easter! I smiled all the way through this post as you shared your Easter memories, Bonnie. 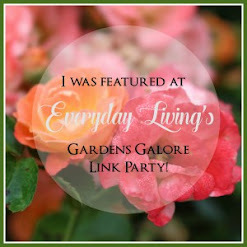 I love how your treasure your family's heirlooms, and use them! The ceramic bunnies that your dear Mom painted are just adorable. I was just admiring the painting on your wall, and then read that your daughter painted it! Thank you for sharing your memories and table with us. So many of us share those same early Easter memories, baskets, eggs, and special dresses for church. Your table is full of treasures which is the most special thing along with the memories that go with them that you can bring to your table. Thank you for joining us on one more hop! Bonnie, I love your table and your memories. How sweet are your Mother's rabbit family. I especially love all the memories you have as I have them too....just a different time and place. It seems as we get older we hang on tight to our memories and you have some very special ones. Your daughter's abstract is lovely. It seems talent runs in your family. Happy Easter my friend. 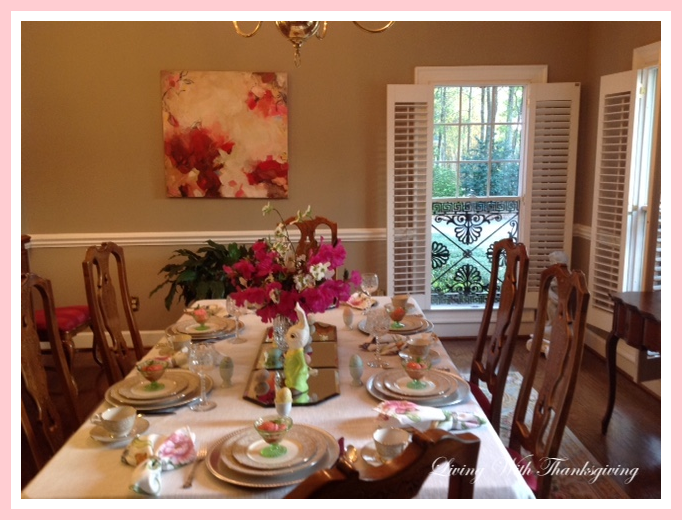 Azaleas couldn't be more perfect for a Southern Easter table Bonnie, and paired with your mother's bunnies and your daughter's stunning abstract on the wall, you have a room full of family memories! I too fondly remember Easter Sunday, dressing up with my sisters and going to church. Then we had to eat breakfast before we could hunt for the treasured Easter eggs! Happy Easter Bonnie! Bonnie, what a beautiful table and what beautiful memories. The bunnies made by your Mother is absolutely priceless. I share your memories of growing up, getting the new dress, patent leather shoes with white socks, gloves and hat. How fortunate we are to grow up in Christian homes. Your new abstract is quite beautiful. Your entire post was heart warming and beautiful. I, too, will be singing At the Cross today. 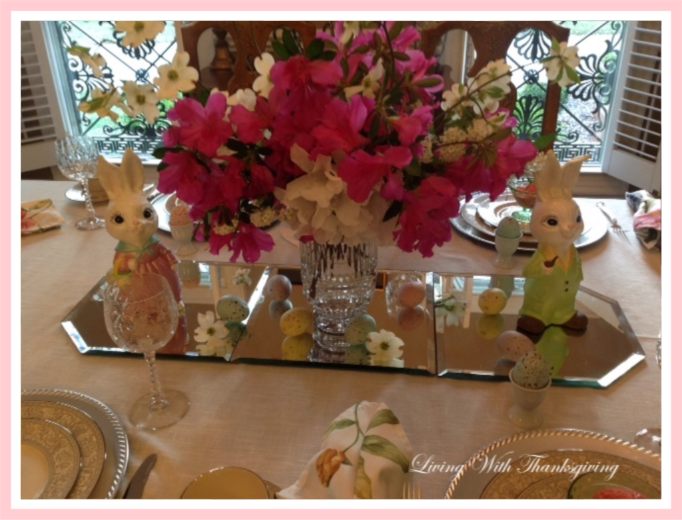 Bonnie, I enjoyed you sharing your Easter memories as much as your charming table. My mom always made us new dresses and matching coats. I love looking at the old pix of us in hats with pretty purses and lacy ankle socks. It's wonderful having the rabbits your mom made. Tomorrow I'm sharing a nostalgic, vintage table too. Your table has all of the elements for being a classic. 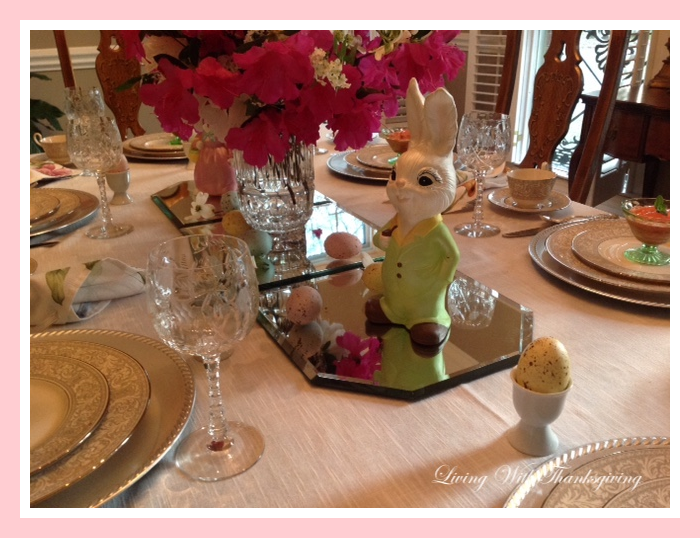 Elegant china and vintage crystal from loved ones, the lovely perfume of the bright and bold colorful azaleas and the whimsy of the playful Mr and Mrs Rabbit which once graced your mother's Easter table. What a lovely story. 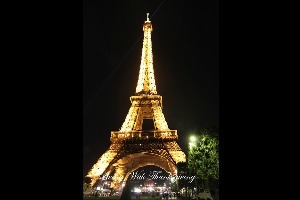 As touching as the beautiful design. Your daughter's art work is proving that artistry runs through the family. 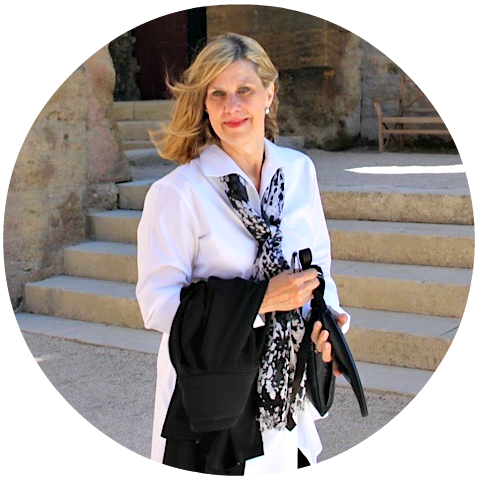 Bonnie, so glad to see you here on the blog hop. Your azaleas are just gorgeous. We don't have any yet ~ a couple more weeks of warmer weather are needed. Your china is lovely and goes so well with the etched glassware. Love the bunnies on the mirrors. Also love your song. It's a good one. Thank you for sharing your precious childhood Easter memories. Your love and appreciation of the past shines beautifully on this table and the painting is gorgeous. Happy Easter! I love your Easter memories...so sweet! I love your table...subtle, elegant and colorful! I miss dogwoods and azaleas. They do not grow in our area of Texas. My yard back home in Alabama had so many azaleas and I had two beautiful dogwood trees. I loved it when they bloomed! Hugs! Bonnie, so many have shared the same Easter memories. Sweet Easter dresses, a cute hat and pretty patent leather shoes. This brings a smile to my face. Such wonderful talent in your family, from your dear Mother and daughter. How special to have those adorable bunnies. 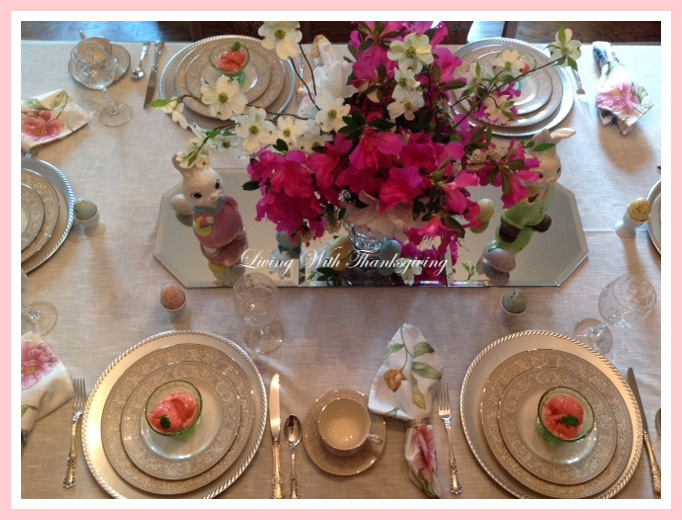 Beautiful china and lovely fresh flowers bring freshness to the table. Happy Easter Bonnie. 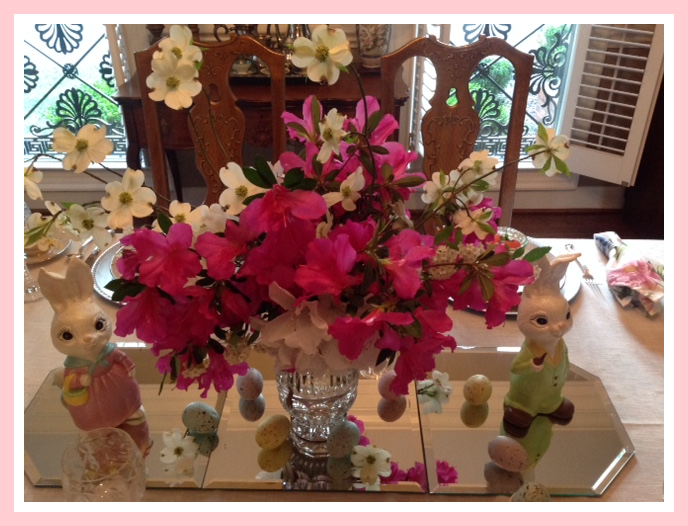 Bonnie, your fresh floral arrangement of azaleas and dogwood is stunning. I love how you used a mirror to set off the centerpiece. I love the bunnies! Yes, Mr. Rabbit looks stylish in his 70's vest. Family items are precious to me, too. It's so nice that your dining room has pieces from your parents, friend, in-laws and daughter. So happy to join you on this hop. Have a blessed Easter! Bonnie, your Easter memories made me smile and so remind me of my own. Mr. Rabbit looks so dapper - I can see why you'd feel so happy that he's at your table for Easter! Happy Easter to you and your family! I love this post and your beautiful table. 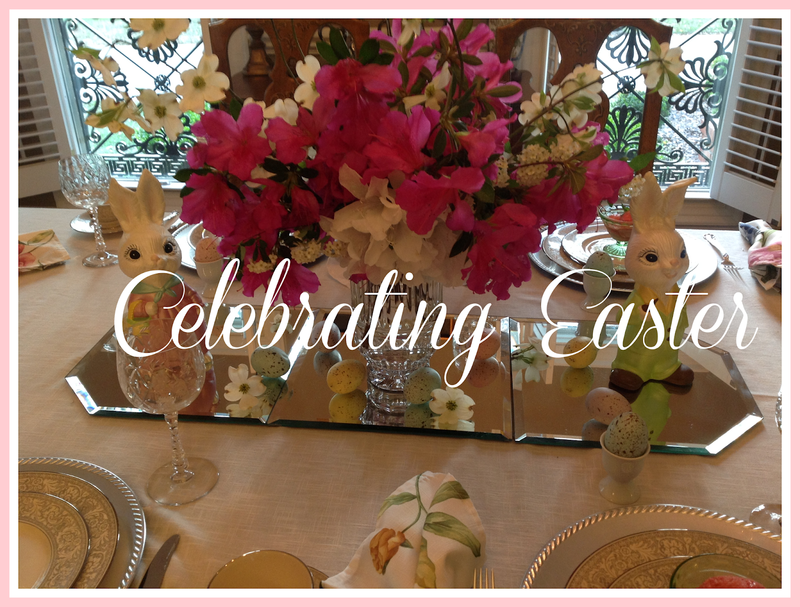 Your ceramic rabbits and fond Easter memories are precious. 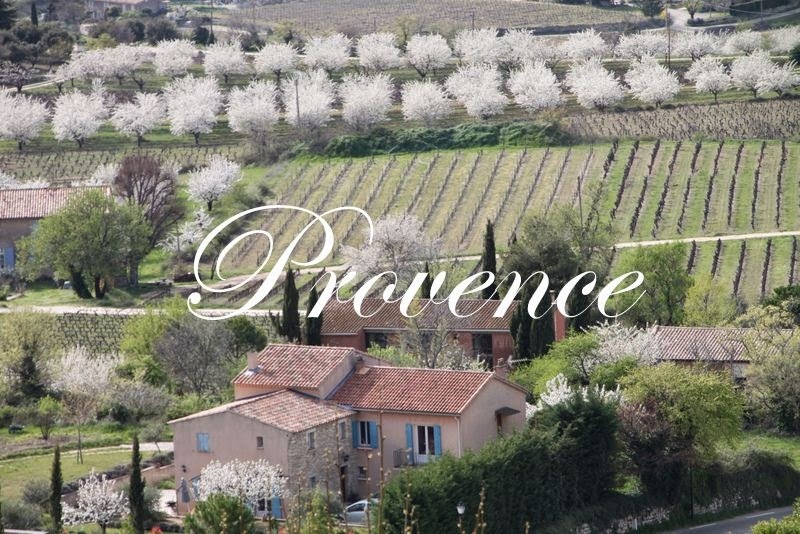 Wishing you a very Happy Easter!